If you’re like me, you need your hair to be at its healthiest for blogging. But lag and constant particle pollution can eventually dull your pixel wig, making it shine less and less as time goes on. That’s why I use RC Cluster Shampoo and Conditioner. It comes with animations so you can actually wash your hair, deep-cleansing particle soap bubble action, and a great set of bottles for prop display. 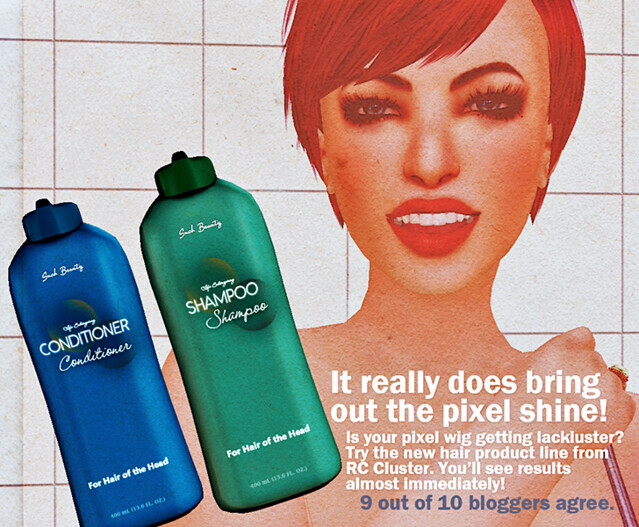 It’s everything you need when it comes to keeping your pixel hair looking its best. RC Cluster. Trusted by 9 out of 10 bloggers on the grid. Now available at fine RC Cluster mainstores.